BRASILIA, May 3 (Xinhua) -- The Olympic torch has arrived in Brazil, marking the start of a 95-day journey that will end at Rio's Maracana stadium in August for the Olympic Games opening ceremony. The flame arrived at the international airport of Brasilia at 7:25am local time after being carried inside a protective lantern on a flight from the Swiss city of Geneva. Brazil's President Dilma Rousseff officially received the torch ahead of its 325-city relay of Brazil that will involve around 12,000 runners. At a ceremony to mark the flame's arrival, Rousseff vowed the international community would be made to feel welcome during the Games, despite the country's ongoing political and economic crisis. "We know the political difficulties that exist in the country today," Rousseff said. "We know about the political instability. Despite being in a very difficult situation, Brazil will be capable of (successfully staging the Games) because we have created all of the necessary conditions so that all athletes and foreign visitors will be well received." Brazil is mired in its worst recession in decades and Rousseff faces an impeachment process for allegedly manipulating government accounts. If the senate votes in favor of opening proceedings against her, Rousseff will be removed from office for six months and replaced by her deputy Michel Temer. The embattled leader said Rio de Janeiro was ready to stage the Games, with construction work at most sports venues already finished. "We are ready," she said. "We have worked for this. Practically all of the Olympic venues are ready. All of the 39 test events that have taken place until now have been well conducted." 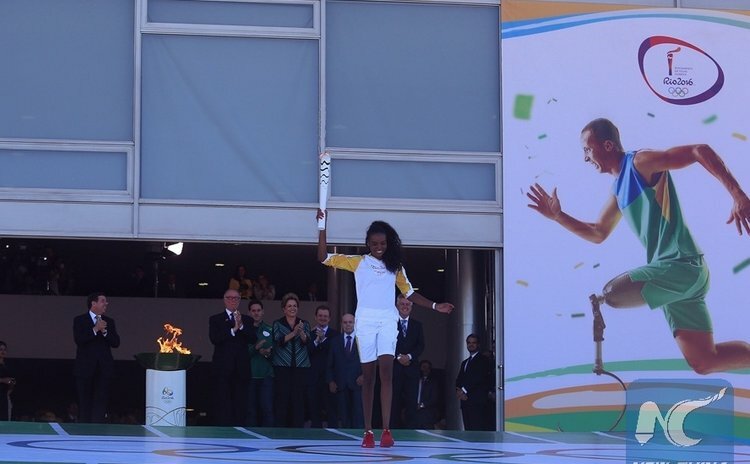 The torch was lit on April 21 during a ceremony in the Greek city of Olympia, considered the Games' birthplace.